The views listed here are my own. I'm not looking to debate, pick a fight, or get anyone riled up. I'm just getting some things off my chest. I can, because this is my blog! If you don't like it, don't read it!!! 🗽A couple of people had this in their Facebook statuses: Hate won. No, hate did NOT win. I think morality won. I'm not saying our President-Elect is the epitome of morality...he's far from it. If he stands by his platforms, this country will be back on track to gain back some of her morals. 🗽Women voting for Hillary because she's a woman and they want to see a woman in the White House is just wrong. To say so on national tv is just embarrassing. 🗽I don't like change. There, I said it. Any time a new president is elected, there's going to be change. The older I get, the scarier it is. But, you know what? The USA survived Carter, Clinton, and the Obamas (why is it always plural and not just him? Hmmmm) ...we'll continue to survive. Our country isn't perfect, but it's still the best there is! 🗽As a Catholic, Hillary scares the ever-loving crap out of me. Her anti-Catholic rhetoric and ideals are just frightening to me. 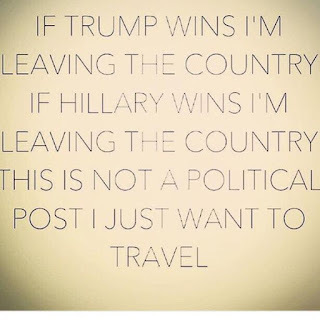 🗽Best post I saw this morning (from 1 of my Kindergarten teachers...thanks, Hailey! ): "You get what you get and don't pitch a fit." Be an adult, be proud of our country, be thankful you live in a country where you can vote and not be afraid of being persecuted because of it. 🗽Last May, when I heard Father Leo Patalinghug talk, the race was just in it's early stages of being frantic. He said that in the end, this nation will still be 1 nation under God. 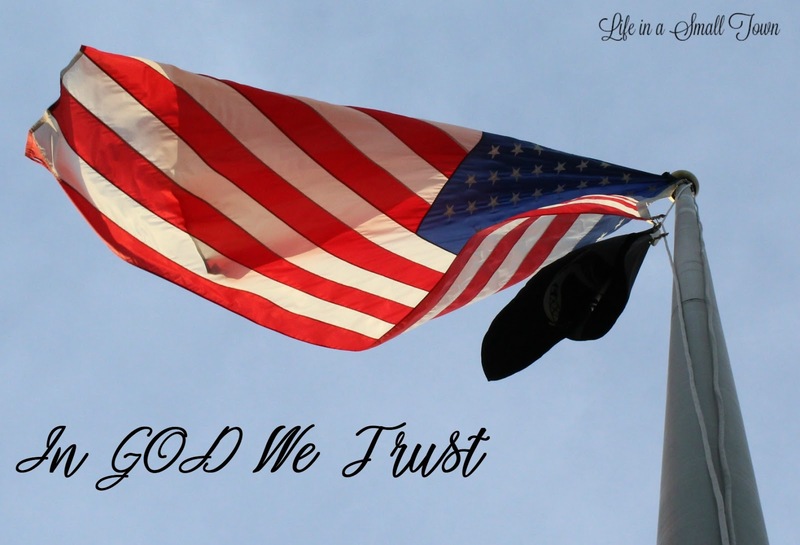 Continue to pray for our country; don't stop just because the election is over. She needs as many prayers as she can get! 🗽Finally, I saw this youtube clip yesterday. Nice to see our northern neighbors reminding us how great this country really is! Love your candor and your post today. Our church had a special communion service last night that I attended. I needed to . the message was unity and that we can all be one in Christ. No matter what Christ is bigger than any election. That is what I am holding onto and praying that the hate from both sides can subside and that we can just get on with it. Your post was interesting. I voted for Hillary. Not because she is a woman, but because I thought she was smart enough to listen to her advisors. And to have good intelligent advisors. On the other hand I do not believe that to be true of the man who won (I can not even bring myself to say his name), he is too arrogant to listen to advisors, because he will always know best. He will bring for sure, but I am not sure we can survive it. I will continue to pray for our country. We for sure need God back in control of it. I'm never good with change either... & I always feel sorry for the loser whoever it is. They put their life on hold to do this for years. I cant imagine what its like after you loose. I dont get the idea that if you voted for Trump, you are a racist, bigot, all the other yucky things. To me, its about the party more than the person. I think so many people are just so angry right now, its all about the lashing out. Hoping things calm down soon. 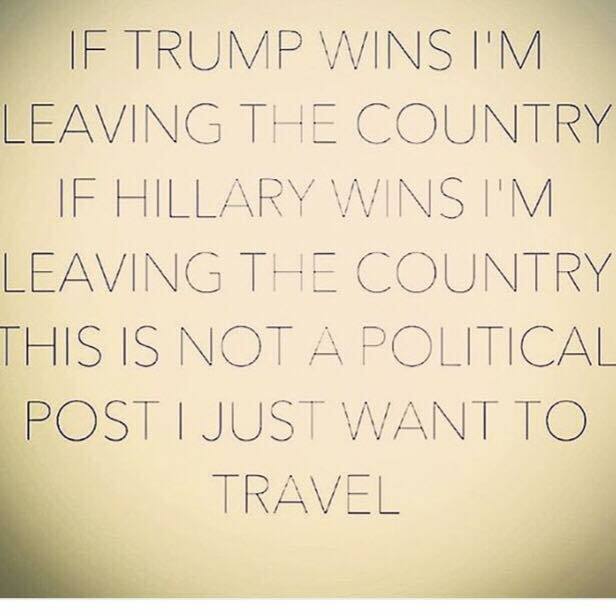 I'm laughing at the "I just want to travel" bit!! I'm glad it's all over! Well said and I agree with you. Amen!!! I prayed really hard about this election. Great post. I didn't decide who to vote for until I was in the booth. The idea that students need safe spaces and coloring books to deal with their grief over the results is absurd. the idea that as a woman I should vote for ovaries is absurd. The idea that if you disagree with someone you become a hater, homophobe, misogynist, racist is absurd. The idea that posting that you "just threw up in your mouth," is productive is absurd. The idea that I have to be afraid to share my convictions because it isn't "correct" is absurd. We are all entitled to our own opinions. We are not entitled to our own facts. Hey America, you want tolerance? It might help if you start practicing tolerance!